Agile organizations, restructuring, digital transformations and digital innovators. Popular words at management meetings and dinner and drinks conversations. Many are currently closely monitoring ING to learn from the large-scale restructuring that the bank started in 2015, and the ING ‘Agile At Scale’ model that is its centerpiece. Simultaneously, we are all working hard on making the next step of our own journey toward digital hero status. There is no holy grail or a particular journey relating to becoming a more agile and innovative organization. This is one of the key conclusions of the event ‘Spotify-ing your organization’ hosted by Xebia on 24 November 2016. 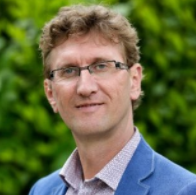 Vincent van den Boogert, CCO ING Netherlands, told us more about the lessons learned relating to the organization-wide transformation program of ING, which will undoubtedly end up as a case in many study books, irrespective of the outcome. The Executive Board went to Sweden and were inspired by the open model of Spotify, also checking out companies such as Google and Zappos. The Board members were convinced, and swiftly got to work on disruptive change of the organizational structure. Furthermore, Max Mouwen, managing partner Xebia Strategy, presented the results of the Digital Acceleration Survey 2016, based on over 200 large and medium-sized organizations. The ING case and the results of the survey provide great insights into agile restructuring and digital acceleration. For inspiration, we have set out three remarkable issues below. Digital excellence is not achieved by high performance in a single specific dimension. However, it generally starts with a clear answer to the ‘why’ question. Once the “Purpose, vision, strategy & goals” are defined and specified, the efforts and energy of the organization also potentially lead to better results. In this context, it is remarkable that almost one quarter of the respondents to the Digital Acceleration survey indicates the class themselves as a digital beginner (the lowest score possible) in this dimension. No clear purpose and/or ‘me too’ digital strategy form a basis for this assessment. It does not have to be that way. ING specified its purpose & vision for the entire organization. But ING goes beyond that in this domain. Each autonomous team (called a ‘squad’) defines its own clear purpose, as much as possible based on the perspective of the impact it aims to make on clients. For each decision made within the team, the follow-up question could be to assess the maximum contribution to the set client impact goal. This creates teams with a super purpose, including super focus on the client. Agile working and autonomously operating teams are often associated with teams that are fully independent and free (‘autonomous’) in making all possible decisions. Whereas the Executive Board and management are used to steering and control (‘Alignment’), certainly as strategic interests increase. In this context, Alignment and Autonomy generally initially cause some friction. In the survey, 12% of the respondents is self-assessed as world class in “high empowering culture” (the maximum score). Simultaneously, 13% is self-assessed as world class in respect of their “top down, bottom up & adaptive approach” relating to digital and non-digital goals and KPI’s. A high self-assessment score, certainly if world class is actually defined as the standard at worldwide level. A key insight of ING is also that Alignment and Autonomy are not opposites. In fact, in their experience, Alignment is the enabler of Autonomy. Teams quickly asked for more direction from the Executive Board and the management to be able to make the right squad decisions. Today, the ‘Tribes’ (a group consisting of several squads) determine what and when they deliver in the coming three months. This planning process is fed by the Executive Board by determining 6 to 7 priorities for the entire organization. Simultaneously, the process is fully transparent, both in a vertical sense (from Executive Board to tribe and individual squads) and in a horizontal sense (between tribes). This way, various tribes and/or squads ask each other why certain choices are made and to what extent one tribe could possibly factor in the spearheads of a different tribe (in planning or deliverables). 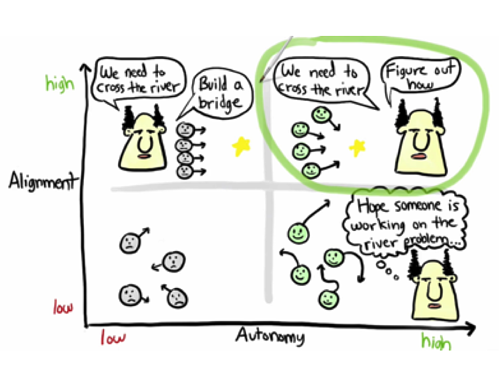 Alignment enables Autonomy. ING also took extensive inspiration for its transformation from Netflix, Zappos and several others to obsessively eliminate all ‘hand-overs’ between departments. ING is realizing increased efficiency and effectiveness by having the teams operate even more autonomously by managing on ‘zero hand-overs’. Respondents of the survey mostly assess their company as a more traditional than a highly adaptive organization. The figures clearly show that many organizations have a more traditional structure. Although organizations increasingly based their operations on a purpose, and organizations are focusing less on just profit, many organizations still have the key features ‘hierarchical’, ‘control’, ‘planning’ and ‘IT legacy’. Most organizations needs extensive change before being classed as an Agile organization. A characteristic of more agility is also that an organizational restructuring could be completed ‘agile’. ING defined its own ‘Agile At Scale’ model before starting the organizational transformation. Part of this transformation is that the model may evolve in an agile way. The model itself is also agile and flexible. The explicit expectation is that adjustments to the agile model will be implemented for many months, even years, after the start of the transformation. To truly make your customers the centerpiece and to respond to the wishes and needs in the market, you need to structure and operate your organization in a different way. Working Agile is not just setting up a different structure. The key point of attention is a cultural change. This cultural change plays the leading role in ING’s transformation. A new internal culture code was prepared together with the employees: “The Orange Code”. ING chose to implement this cultural change in one fell swoop, followed by working in the new system. All employees had to apply for a new role to gain a new job in the agile organization. Entire management layers disappeared. The driving forces in the new style are not top-down managers; instead, they are part of the team and work within the team. Appointments of employees in key roles in the new agile organization (including tribe leads, chapter leads and agile coaches) were focused on hiring people who wanted to embrace this cultural change and were able to express this to their new teams. Agility and flexibility are not just reserved for small, new, hip companies. Even established large banks are able to make the change. Please note that a cultural change should never be forgotten or underestimated. You may have a very well-considered business plan and technological architecture at a very high level - but the change cannot be successful without the right motivation and the right mindset. After all, an organization is never 100% finished with a change or transformation. So make the change. And then make it work.